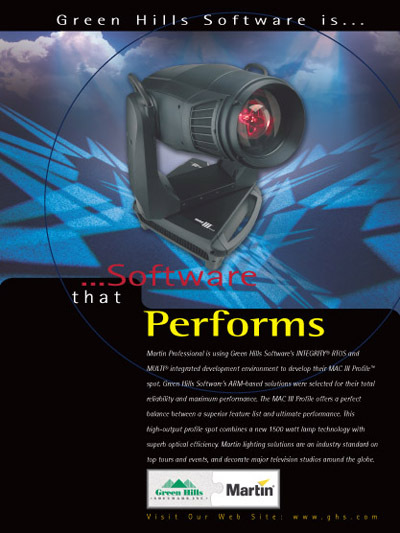 Martin Professional is using Green Hills Software’s INTEGRITY RTOS and MULTI integrated development environment to develop their MAC III Profile spot. Green Hills Software’s ARM-based solutions were selected for their total reliability and maximum performance. The MAC III Profile offers a perfect balance between a superior feature list and ultimate performance. This high-output profile spot combines a new 1500 watt lamp technology with superb optical efficiency. Martin lighting solutions are an industry standard on top tours and events, and decorate major television studios around the globe.